e-mail with your name and address, stating whether it is for a recital or function. 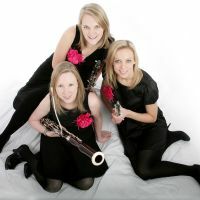 Additional Info: The Marylebone Trio was formed in 2003 by three students of the Royal Academy of Music. Since then the group has been touring the country performing to appreciative audiences, many of whom have commented that it is good to hear something different from their usual diet of strings and piano. The trio’s concerts have gained a reputation not only for displaying individual skill and excellent ensemble but also for being lively and informative with an interesting mix of music. The Trio has travelled the world performing on Saga cruise ships and have also provided background music for functions at a range of London venues including Kew Gardens, the Dorchester Hotel, Lincoln’s Inn and – of course! – Marylebone station. One of the things that distinguishes us from other groups is our wide and varied repertoire. Over the past ten years we have worked hard to expand our collection of music, and now our repertoire ranges from Bach through to arrangements of 21st century rock and pop music. Much of the music is arranged by the trio, and we pride ourselves on being able to organise for just about any special musical requests to be catered for. If you have something particular in mind – be it classical, jazz, pop or a show tune, just ask us and we’ll see what we can do! Our usual fee for a two hour set is £360, which covers travel expenses and any music arrangements you might want. This fee is dependent on venue location and playing time and is negotiable.